Powerful programmer for the Atmel 89 series of microcontrollers that includes 89C51/52/55, 89S51/52/55 and many more. This entry was posted in Digital Electronics and tagged 8051, 89C51, 89C52, 89S51, 89S52, Atmel, microcontrollers, Programmer. Bookmark the permalink. the pcb outstanding, how did you make it, could you share the approach you’ve tried here?? Thanks. Nothing special brother. 🙂 Im using Screen Printing method. You can gain some idea about if you watch you tube videos about Screen Printing. Mr. pasanlaksiri, can you send to me the pcb picture of Atmel 89 Series Device Programmer, because I have made it, but it’s no work with my pcb. You mean top layout ? WOW, I have been searching for such a Programmer. 2. Can we Use SERIAL – to – USB converter to use this with LAPTOPS ? Mr. pasanlaksiri, can you send to me the circuit diagram and PCB of Atmel 89 Series Device Programmer, because I have made it, but it’s not work with my pcb. May be you can send to my email. You better check those ZENNER Diodes. How much power do you apply to the circuit ? Thanks for this free circuit. I have build this circuit and the after fixing a few mistakes the software is now detecting the programmer. But, as soon as I tell it to load a hex file onto the target, it gives the following error : “ER03: Chip not detected”. Any ideas? Hey you must thanks for the original designer of this cute programmer. Please see this image. 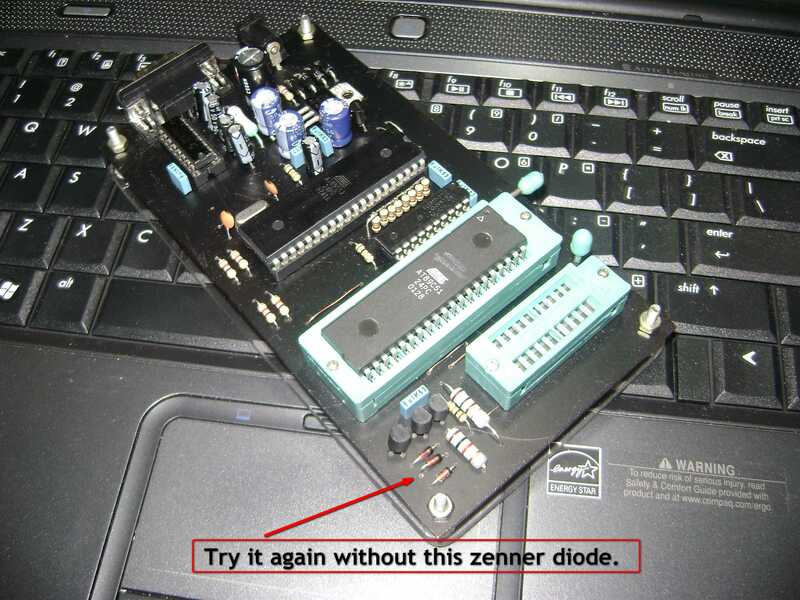 Try it again without that zenner diode. Is your power supply at least pumping 12 volts. What do you mean by power supply is okay. You are supplying 9V or 12V ? your guess was right. programmer at our college also has the same problem you said earlier and i removed that zener and that worked.!!!!!!! but no use in my programmer… ! i think i’ve soldered all well. i checked it with multimeter to check continuity nd short circuit.. but all was fine. k let me check it. i’ve prepared two pcb’s nd i got the same error…!!! may i know what is the meaning of that?? my programmers firmware was detected in both the cases…. Thats mean for some reason it cant find the target chip. On the other had, Communication PC to your programmer is fine. You have to check target chip components. Is there any difference between LM7805 and 78L05??? No both same. LM7805 – TO220 Package. LM78L05 – TO92 Package. AT LAST MY PROGRAMMER WORKED………..!!!!!!!!!!!!!! THE PROBLEM WAS MY PULL-UP RESISTOR WAS DAMAGED…………… THANKS FOR YOUR GREAT ADVICE………. YOU ARE SUCH A GREAT FRIEND………..!!!!!!!!!!!! ONCE AGAIN THANK YOU VERY MUCH………………..!!!!!!!!!!!!! He he coool. I am also happy coz some how I help you a little. Even i am facing the same problem (Firmware Detects but not IC) as u did. did u remove or keep the zener diode ? Is it mandatory to use 12v suppy, I am taking power from an adapter which gives around 10v. hey friend can u direct me any usb pic programmer?? You mean DIY 8051 USB project or Just go ahead and buy type one ? DIY…. Either PIC or 8051 uC…..
Not sure about 8051 DIY usb projects. I haven’t search for such. But for PICs you will find tons of DIY USB Projects. You better read the entire post before you post. I have provided many links for few people. බොහොම ස්තුතියි මේ වගේ post එකක් දැම්මට.. මම මට වුවමනා කරුණු ටිකක් මේකෙන් හොයා ගත්තා…. * microcontroller එකක block diagram එකයි CPU architecture එකයි කියන්නෙ දෙකක්ද එකමද? * මට AT89 එකේ ඔය උඩ කියපු ඒවා දෙක හොයාගන්න පුලුවන් තැනක් කියන්න පුලුවන්ද? Hi, Could you please call me up. Coz it will be easy for both of us. Else I have to write hear an essay. He he. Yum Yum. I love 8051 micros. But I think you better go for STC 8051 microcontrollers other than Atmels 8051 chips. I make 89serie programmer single side PCB hex 4.1 in 89s52 I try pc software ProLoad 5.4 & 4.1 and MCU_PG all the same – Device timeout (chip not detected)!!! I make this programmer before two month and works fine, I use programmer several times and works fine. Today I start programming 89C2051 and got Chip not detected!!! Its not short circuit I use clear varnish to protect bottom side of PCB !!!! Okay you said it worked two months back and now its not working. So clearly there must be some problem with your PCB. If your using Windows 7 run it as admin. Sorry I do not able to answer your question until I physically check the board. I resolve my problem today. Problem is in firmware hex 4.1!!! I just reprogram it with ver 4.4, and works fine. I surf on net I found lots complaining on that “device detect timeout”, even when people make several pcbs and all have the same error. No PCB problem, no short circuit I check several times, I have clearly protection film on bottom side of pcb. Hi, lovely to here that you resolve your problem. But you know that programmer is burning chips for me more than 2 years now. Yes, people do complain about the programmer here and there. But when get to the point it always coz of bad parts, small cracks on the pcb, zenner problems and etc. It is always will be the best ever free programmer. I was shocket when I try to program 89c2051, when I see that error message. I protect my pcb and keep it safe in box with other programmers in room 25C-27C. Also bottom of pcb is protected with clearly safety film. Also confused because programmes worked and now not – nothing changed on software or hardware. I start inspecting pcb with unimer (ohm), free eye, eye and magnifier 10x, pc usb microsocope x20 and short circuit or damage found. I check voltages on pcb on multiple points all ok. I try to uninstall program and install it again ProLoad 5.4. I try to change COM port settings, try to change to other com port but the same error. I get out all chips from their sockets 89S52, 74HC573, MAX232 and put in again, but without success to resolve error. I found S.S.4.4 firmware and put him into 89S52 and all works fine. I nothing else changing on board, just reprogram firmware and works. I start inspecting pcb with unimer (ohm), free eye, eye and magnifier 10x, pc usb microsocope x20 and short circuit or damage not found. Does anyone program 89c2051-24SI (SMD) with this programmer? Does it work? I try and get “device detect timeout”. I make DIP20 to SO20 pin to pin, adapter have shot wires as possible almost as dip socket. 89c2051 DIP works fine now, but smd dont. I forgot to tell I check wires on dip20 to so20 adapter with soldered 89c2051-24si on it, all pins on adapter have contact with desired SMD pins, no short circuit between them. I just program 89c2051-24SI SMD via my DIP20 to SO20, with BlowIt programmer and works fine. After I try programmed uC in project circuit and works like charm. That means adapter and 89c2051 are ok! Twilight zone with Sunrom 89serie programmer!!! Something creapy is going with this programmer!!! 89serie programmer works fine with all dip (89s51,52,89c2051) and not with 89c2051 smd! Sunrom 89serie programmer cant program 89C2051-24SI SMD !!! All DIP works fine, but 89C2051-24SI (SOMD) NOT!!! I supose this is because bad pcb design (single side used) long traces on pcb to 20-pin socket + traces on DIP20->SO20 adapter. Response time is greater than programmer allow. Adapter have shortest possible trace on pcb almost as DIP. Chip is soldered on adapter, and adapter and chip working on other programmers. I checked everything throught half day, components, pcb, all connections and short circuits. Checked pins direct from smd 89c2051 to desired longest pins or contacts on pcb on bottom and top. Checked short circuit wires on top. Resistors, zeners,… all checked!!! What to say I disapointed in this programmer, of course this is DIY (homemade). hi……Please tell me ,in which link i found firmware 4.4 .
today i came across ur website. i find it very interesting. and i have a problem. I made that “Atmel 89 Series Device Prog”. I installed firmware 4.1 i.e for single side pcb using Asim’s Parallel port programmer. But sometimes it write some hex files without error, (2 out of 10). i m attaching screen shots of the error, Please help me with this. i worked on this project for 2 days. I have also tried its Firmware 4.4 but same problem. and i have tried it with proload 4.1 and 5.4 both. but same thing. I have done this with proload 4.1 and 5.4 .. Same problem. ooohh, Then FOR SURE PLZ CHECK YOUR HARDWARE A to Z and Z to A. It is a HARDWARE PROBLEM. What method did you used to print that PCB ? Sometimes it works without any error,. The error occurs only when i verify the hex file. and instead of 100R register i’hv used 120R coz i didn’t find it in market. And sir Which material u have used in ur pcb coz its not cooper clad i think. Exactly as I thought. Hey its not the RESISTOR issue. Its seems to be your PCB issue. Even if you check every track on your PCB using continuity tester all the tracks may seems to be okay. But it isn’t. At least try to solder most critical tracks. I saw many circuit issues coz of PCB problems. and sir please aslo tell me how to drill in pcb, i mean i used hand drill but its very time consuming. and cani get an electric drill online?for pcb in india.? Yes I use a PCB Drill. Yes I guess EBAY India or most of hobby shops does have mini PCB drills. Cheap too. Some of the screenshot are with proload 4.1 but i have done same proceder with 5.4 also. but same problem. I don’t it is writing any hex to the chip at all. See it shows ZERO BYTES USED. Hex file that your trying to program isn’t your own program right. When you try the HEX file that I gave you does it gave you the Same Exact ERROR or Different one. By the way have you try it with 89S51 ro 89S52 ? its giving the same error with the hex file u gave, i’hv tried this with 89s51 and 52. same error. I think i should make othe pcb board, can u give me some information about silk screen method. i watched youtube videos but they all are for Printing t-shirts etc. and which material have u used for ur pcb its black ???? Then definitely its your PCB problem bro. I have used PHOTO TRANSFER. Yes SCREEN PRINTING is also PERFECT. I think u locally can find a guy who doing SCREEN PRINT stuff. Give him your artwork with Copper Clad. He will do the rest. okey sir, thank u so much for ur help. No Problem. I actually have a extra Screen Printed PCB lying around for long time. I can send it to your way. just leave me your details ( mail me ). I cannot find it at any other sites. I’ve built this programmer once about 2 years ago, and it failed. Even no communication could be established from PC. Yesterday, I’ve read this page, and decide to build once again by redrawing the pcb using sprint layout 5. I use Asim Khan simple uploader to burn the firmware 4.4 into the at89S52, and carefully soldering after checking those tiny tracks. And … IT WORKS !!! and finally I know what caused the malfunction of my first built programmer. The firmware chip is loaded with TEXT file of the HEX file, not the binary code. If anyone interested with the layout, I can send you via e-mail. It’s really worth to built , as there as so many of these old chips spread around the junk box. Hi Joe, Yes exactly. Most of the people who love this programmer get fail because of the PCB issue. It is love to hear that you built this one. if any friend help me . At first I also thought like that. I also had the question Where to Start? Hey friend , can i have the latest firmware for this programer?? Can somebody mail me or post firmware 4.4. , because I can’t find it. My mail is ivanspas@hotmail.com. Also my programmer won’t detect my 89C51 microcontroller (I use proload 5.4). 1. What stuff did you use to connect your hardware to your laptop?Did you use USB to RS232 cable or any other cable? Could u Please send me the pictures to explain PC to hardware communication? 2. Can we use 40 pin IC socket instead of 40 pin ZIF socket to insert the 40 pin IC. Is there any problem with that? I am asking this thing because ZIF sockets are costlier than simple IC sockets. Hello. Raskr, I am using FT232. Please google it. The reason of using zif socket, u could easily plug it and remove it. U also could try ICSP programing. Can anyone plz mail me firmware 4.4 at ata_ijaz@live.com. Hi, Nash. When u read the chip can it detect the chip? Btw have you try 89S series? Hello Pasanlaksiri, Ya! it is auto detecting the chip, and all the process are completing well but on last step of verifying the written program it show that above mention error. I have already check my pcb its good. how can i load firmware hex code to firmware IC….using universal programmer or above design itself …..
Hi there. Please check the end of the post. I have uploaded fresh two links to download. I got lots of comments regarding this programmer. 99% of those problems because of PCB issues, Faulty Parts and Specially ZENNER Diodes. Another thing when you print the PCB, copper tracks may look fine, but please double check the PCB before you solder it. hey guys I make same programmer with single side pcb.I used proload& firmware v41but it not detecting device..